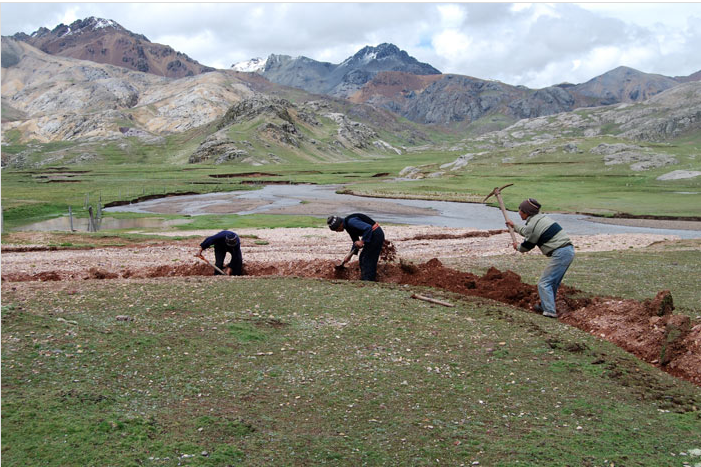 Large hydraulic projects that aim to capture and control water flows are increasingly entering territories of local Andean communities. 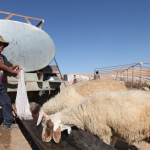 This is a story of pastoralists in the region of Huancavelica, Peru, who stepped up in defence of their local wetlands, pastures and water sources. After more than a decade of protest, alliance building and negotiation they have established themselves as the crucial actor in inter-regional water governance. The Castrovirreyna plateau is the puna environment of lakes, wetlands and grasslands in Huancavelica and comprises the headwaters of half a dozen watersheds. Lake Chocloccocha, the biggest and most emblematic, is 4500 metres above sea level and source of the Pampas River. For centuries seminomadic pastoralists have used the plateau for camelid and sheep herding. The area currently supports 1500 families, and over 200,000 alpacas, llamas and sheep. Crucial for alpaca herding are the bofedales, or high-altitude wetlands, particularly in the dry season, from May to November. Bofedales are high-altitude wetlands of watersaturated peat material and vegetation. These fragile ecosystems are sensitive to variations in water quality and quantity that come with climatic changes, human intervention (like mining) or herd composition. We challenge two biases about bofedal environments. First, the economist’s bias that these wetlands are wastelands unfit for agriculture. And, as such viewed as an obstacle to progress, best drained or degraded for other economic gain, like commercial irrigation. Second, the conservationist’s bias that wetlands are natural and pristine landscapes where human activity is often portrayed as an external threat. 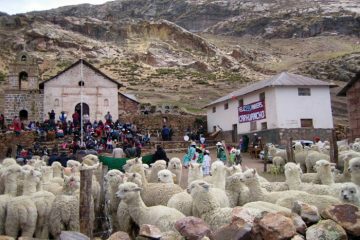 These misconceptions overlook that many bofedales have been manmade and are carefully maintained by pastoralist communities throughout the Andes. As local common property systems, community bofedales are vital to herder livelihoods and economic prosperity. But they are also of regional (watershed) and global (climate) significance because of their ability to capture and store rainfall, glacier runoff and carbon. In the 1950s a dam was constructed to raise the water level of Lake Choclococha and divert 150 million m3 of water from the Pampas watershed to the adjacent Tambo-Ica watershed for commercial irrigation purposes in the region of Ica. The infrastructure submerged the village of Choclococha and interfered with customary herd movements. What is more, the diversion canal was not just a barrier to herd movement, it also prevented runoff from reaching the bofedales. The canal has degraded the environment and caused dozens of human and hundreds of animal causalities. No compensation was ever made. The Peruvian government created PETACC (Proyecto Especial Tambo Ccaracocha) in 1990, a project of the National Development Institute, with the mandate to rehabilitate the hydraulic works in the Pampas watershed and study new alternatives to transfer water to Tambo-Ica. A civil war limited action for a decade and in 2003 the administrative responsibility for PETACC was transferred to Ica, home to the country’s biggest agro-export sector. The prospect of new water transfers had pastoralists worried. There were several skirmishes with PETACC engineers that led to terrorist accusations of pastoralist leaders. In July 2006, the Peruvian government issued a legal decree for an additional 50 million m3 of water to be captured from community territories in Huancavelica and to be destined for Ica via a proposed canal, the Ingahuasi Interceptor Drain. The 73 km canal would capture all springs, creeks and runoff in the valley of Ccarhancho and transport this water to Lake Choclococha where the existing dam would need to be elevated. It would destroy hundreds of hectares of communal wetlands and again ignore the fact that the Huancavelica communities rely on this land and water. The legal decree and interceptor drain outraged Huancavelica civil society and public institutions, and above all, the communities directly affected: Ccarhuancho, Chocloccocha, Santa Ines and Pilpichaca. 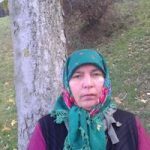 The communities took action to defend their wetlands, to demand participation in decisions on hydraulic projects within their borders and to demand compensation for past damages. The herders of Ccarhuancho organised a public gathering in September 2006, which marks the beginning of a decade-long inter-regional conflict. About 500 people from the four communities were present, as well as a considerable delegation from the Huancavelica regional government and (inter) national NGOs. Many at the meeting were associates of MEGAH (Mesa Tecnica de Gestion del Agua de Huancavelica), a stakeholder platform set up a few months earlier to protect the rights of Huancavelica water users. MEGAH was an initiative of Huancavelica professionals in response to emerging threats to local community water rights. It included representatives of agriculture, health and environment branches of the Huancavelica regional government as well as representatives of national government agencies, national NGOs and international development organisations. The communities’ wetlands defence became MEGAH’s emblematic case. Ccarhuancho leaders spearheaded the communities’ mobilisation and insisted on becoming a full member of the stakeholder platform. A month after the gathering in Ccarhuancho, MEGAH organised a water forum to discuss the conflict. National water experts and invited human rights activists participated in the event and became strategic allies of the communities. After a year of approaching regional governments in Huancavelica and Ica as well as national ministries, and after many negotiations and social protests directed at Ica, PETACC and the Huancavelica regional president, the communities submitted their case to the Latin American Water Tribunal. 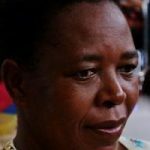 They had legal, logistical and financial support from NGOs and global water justice networks, but the development of the case, historic research and securing emergency backup funding were led by the community of Ccarhuancho and its leaders. In October 2007, the Latin American Water Tribunal ruled in favour of the communities’ water rights: PETACC had to halt the Ingahuasi drain pending an Environmental Impact Assessment and compensation for past damages. Moreover, laws that granted the Ica regional government control over PETACC and the reservation of water had to be revised. Despite its ethical character and non-binding verdict, the tribunal strengthened the communities position in the eyes of both allies and adversaries, and was considered a huge moral victory. A period of dialogue between the communities, PETACC and other stakeholders followed. Representatives from both Ica and Huancavelica government agencies, NGOs and Ica water user associations were at the table. The main point on the agenda was an indemnity programme for damages caused by the existing dam and canal. Stakeholders from Ica hoped to negotiate the Ingahuasi interceptor drain at the same time but the communities wanted an indemnity programme in place first. Trust between the different parties has always been an issue, but constructive communication and the communities’ involvement was positive. Importantly, the communities were able to reiterate their demands: water security and an active role in water related decision making. The process has been full of frictions. MEGAH started to loose influence when a new regional administration was inaugurated and a new stakeholder platform, GTRAH (Grupo Tecnico Regional del Agua de Huancavelica), emerged in 2009. An Environmental Impact Assessment of the Ingahuasi interceptor drain was rejected because neither the Huancavelica government nor the communities had been consulted and an indemnity programme has not been approved or implemented. Furthermore, the key issues of the communities’ involvement in decision making and their water rights have not been addressed. In 2011 the ongoing conflict led to the loss of a World Bank loan of US$8 million. The loan was part of a modernisation project to analyse, administer and improve water management in the Tambo-Ica watershed and the area of inter-basin water transfer of the Pampas headwaters. The newly elected regional president of Huancavelica refused to approve the loan without community consent. And the communities insisted that without specification of how this money would be allocated, there was every chance they would be negatively impacted. Nevertheless, through a back channel, the Ica irrigation sector was incorporated into the modernisation project, but officially, only to focus on the Tambo-Ica watershed. The future of water management in the Pampas headwaters remained uncertain. 2015 marks the beginning of new regional administrations. Similar to previous election promises, the new Ica president announced he would realise the Ingahuasi interceptor drain and again the Huancavelica president is tempted to broker a deal. Once more the communities are responding. It’s a recurring story as long as the elephant in the room is not addressed. While all water in the Pampas headwaters is destined for Ica, and not a single drop or dollar of investment is purposefully allocated to local pastoralists, the communities continue to fight. The consistent and active involvement of Ccarhuancho and the communities in the conflict has proven to be a crucial success factor. While regional politicians, public officials and PETACC heads of staff turnover at a rapid pace, community leaders emerge as the true experts on the conflict. Moreover, municipal mayors are constrained by ties to government and community leaders have more room to manoeuvre. In March 2015, the communities of Ccarhuancho, Choclococha, Pilpichaca and Santa Ines denied PETACC access to their territory to do maintenance. Furthermore, community leaders communicated to authorities in both regions that social upheaval was imminent. With the situation escalating in other downstream communities, the community leaders and regional politicians have been called to the Prime Minister’s office to settle the matter once and for all. Voices from within all branches of government, including Ica’s, suggest that the Ingahuasi interceptor canal will have to be cancelled for good. Silvano Guerrero is a member of the community of Ccarhuancho and since 2015 has been working with CEPES on social aspects of watershed management in the watersheds of Tambo-Ica, Pampas and Cachi. Andres Verzijl is a PhD candidate at the Water Resources Management Group at Wageningen University, working with the Ccarhuancho community and the water struggle in the Pampas headwaters.